NEWTOWN, Conn. [September 13, 2017] – The value of the anti-ship missile market is expected to climb over the next 15 years, according to data compiled by Forecast International. 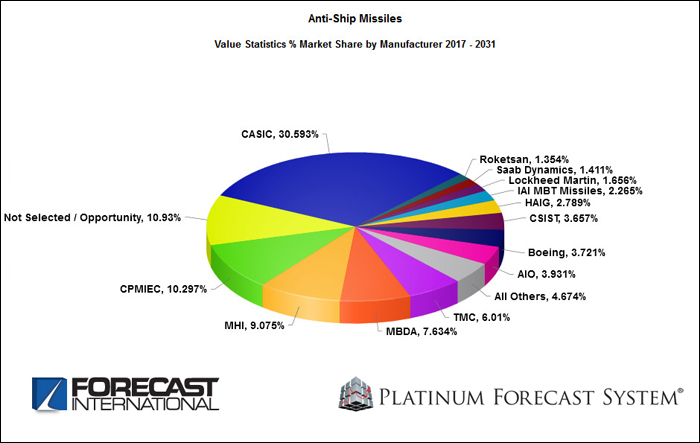 The anti-ship missile market will be worth about $20 billion during the 2017-2031 period, based on data derived from Forecast International's Platinum Forecast System®. During this time, the market's value of production will steadily climb, from $1.089 billion in 2017 to a peak of $1.467 billion in 2027; the market will slightly taper off in the outyears. "China will produce the most missiles, but Western firms and Russia will win the greatest number of individual export contracts," said Larry Dickerson, senior missile analyst at FI. "The systems are overshadowed by their anti-armor and strike counterparts, which are routinely hitting targets in Iraq, Syria, Yemen and Libya," said Dickerson. "Anti-ship missiles have had few opportunities to shine in the last 20 years. Nevertheless, these systems remain an important part of naval combat." New systems are in development, but will not be available until the 2020s. Europe is considering the joint development of a new anti-ship missile to replace a plethora of existing systems. Dickerson notes that the anti-ship market could eventually merge with its strike missile counterpart. "Today, different missiles, such as Harpoon and SCALP-EG, perform these missions," Dickerson said. "Yet missiles capable of engaging a wider array of targets than their predecessors are growing in popularity. Eventually, a single missile could be capable of hitting surface warships and land-based targets, meeting the military's anti-ship and strike mission requirements with a single weapon."